John Morrison of Saskatoon is the lucky winner of our Grand Opening prize draw. 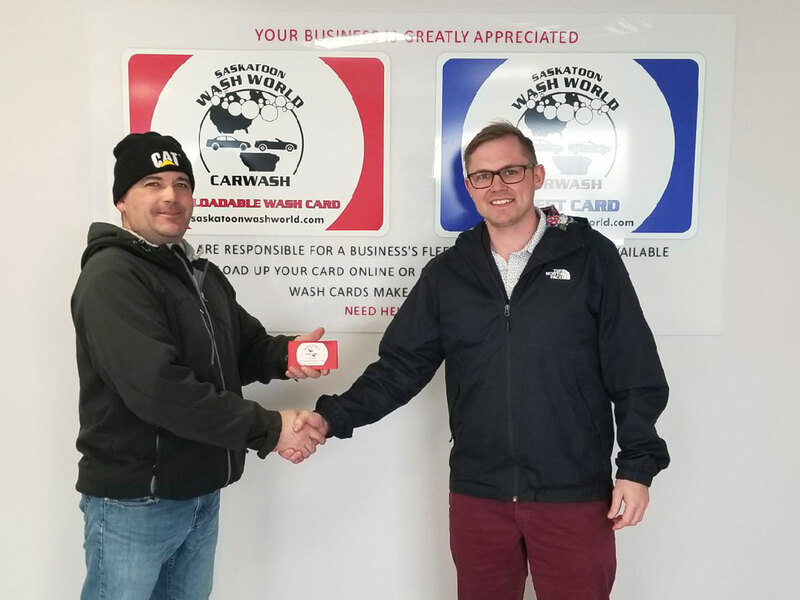 On December 13th, Cole Custead of Saskatoon Wash World Inc. presented John with his prize in the form of pre-loaded wash cards redeemable at any of our locations. Thanks to everyone who entered. If it's dirty, Saskatoon Wash World Inc. has the facility to clean it! 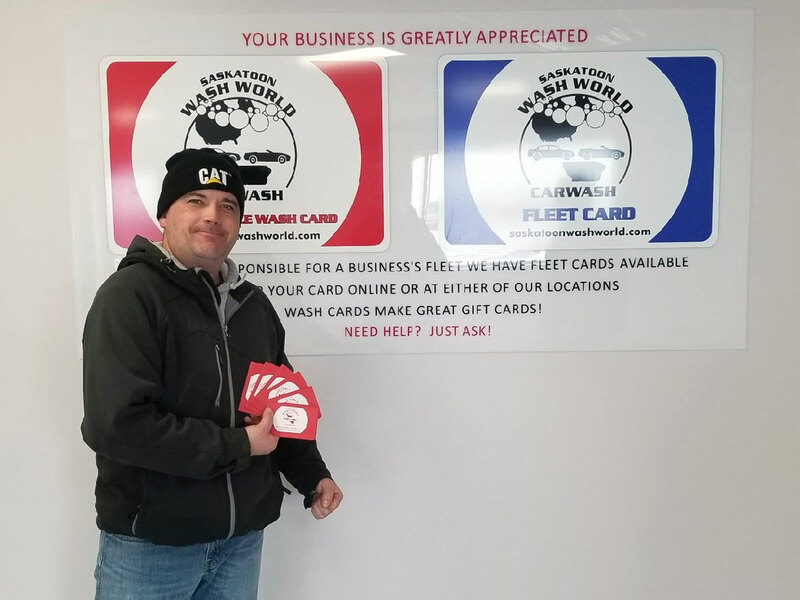 Visit one of our two locations for passenger vehicles with a combined total of 36 wand wash bays. For the big stuff, bring it to our 22-bay truck, RV and equipment wash.
Get in fast, get washing quickly and easily and "Make a Clean Getaway". 12 clean, bright self-serve wash bays plus 2 automatic drive-thru bays suitable for most passenger vehicles. Our newest state-of-the-art 24-bay wand wash facility is now open. Located just 1 block South of Marquis Drive on Faithfull Avenue. LARGEST, NICEST BAYS IN THE CITY! 22 bright self-serve wash bays can accommodate just about any size of truck, RV or equipment. Our self-serve carwash bays feature the latest technology. The bay stations accept Credit Card, Tap to Pay (debit, credit, ApplePay), Pre-loaded Wash World cards and pay by Phone! Print a Credit Card receipt from anywhere. 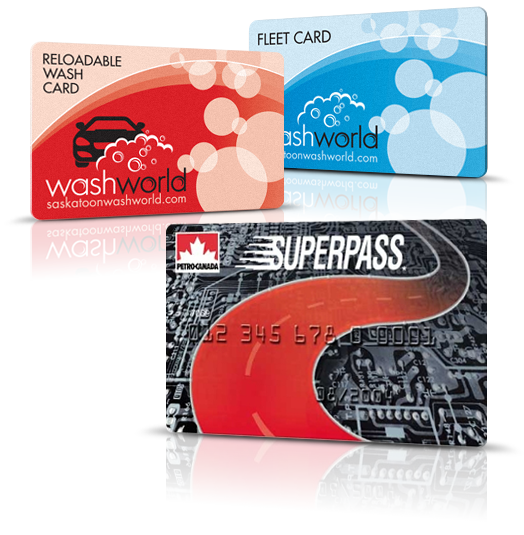 Use your registered Fleet Cards, Reloadable Wash World Cards or Petro-Canada SuperPass. Fantastic. New car wash facility at the far north end of Faithful Avenue that uses reloadable wash card. Highly recommended. Large bays, great pressure and soap for washing vehicles. Convenient payment right at the wash selector in the bay. This place rocks! they let me Shammy off my car in the winter if it is not to busy! Prices are great and they have Tap. Favourite car wash. Place is clean and the products are awesome. This is the place I go or get the mud and deer blood out of my truck. Great staff, bright, clean and always HOT water and plenty of pressure. Thank you Wash World. Nice roomy bays which are well-maintained and quite clean. All of the wash and rinse options you need, for a reasonable price. Attendants are helpful & polite. Nice new carwash with many options to pay in the stall. The price for time is acceptable, pressure and soap is awesome. It's a very nice carwash. To view your receipt, make sure you have your date of service and last 4 digits of your card. Purchase a new pre-paid card as a gift for someone special or reload an existing one. Want to manage your card or mobile account? Login here to access your information.